This was our first show of this season. A lived in grungy smudged black kohled eye. Clean skin with white paint details was the look for the lovely Apu Jan. His shows are always one of my favourite ones as he always have great models, and a clean beautiful look, but he’s also a very very lovely person to work with. All products used are from Kryolan. Han Wen is one of my favourite designers, he's so kind and is looking after everyone in the team. Plus he has great taste and always know what he wants. Lunyee went for a pink and relaxed look for their collection with a light pink eye and a berry lip. Runway photos from British Vogues website. The last show on the Monday at fashionscout was FAD, and my last show for this season. I must admit that I was very very tired at this point. But absolutely loved this look that was designed by Lan Nguyen with help from Face Lace for the lip attachements. My favorite show to work at during fashion week is always Joshua Kane's show. He opended it up for the public for as little as £10 per ticket at the Palladium. This years theme was japanese inpired with samurai swords dancing ballet dancers as the opening act, followed by a runway show with 75 models we had to do the make up for. I worked on the men for the show. These pictures are from British Vogue's website. Sinclair is one of my favorite models to work with, he's always so happy and so good looking. The look for the men was clean skin and darkend eyes to make them look a bit more badass. The Swedish School of Textiles chose a great look for their show, a greasy eye to a clean healthy skin. I'm so Happy Kryolan Sponsor Fashionscout at fashion week. It makes our job so much easier to have a good brand behind us. 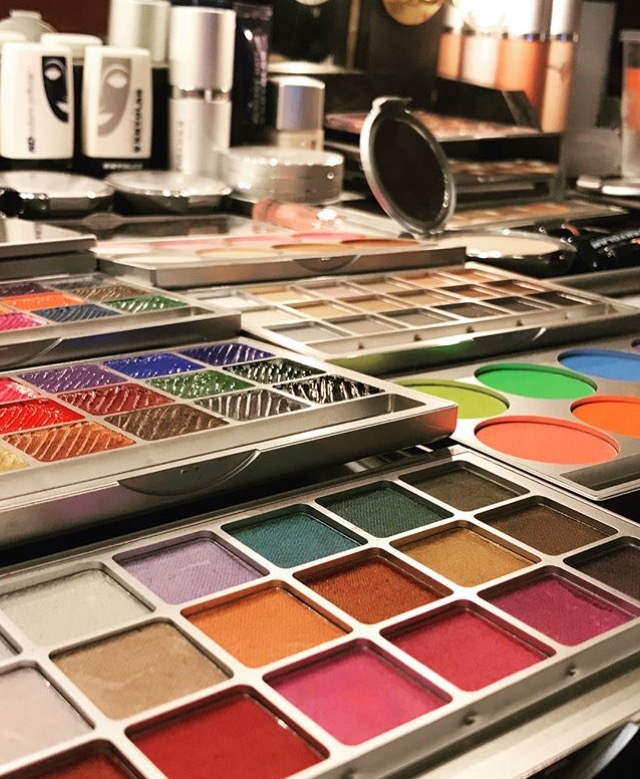 Kryolan is normally known for theatre and tv make up, so it's really fun that they are focusing more on fashion and trying to make the brand cooler. They have EVERYTHING in ANY color, so whatever you need you could get from Kryolan. One of my favorite shows this season was Hallie Sara. A very clean make up with glowy skin, a copper shiny eyeshadow and a thin eyeliner, very minimalistic and beautiful. The hair was kept slick in a pony tale with a sharp side parting. The vibe was very Celine. These pictures from the runway are from British Vogues website. It's funny how the most challenging things you do in live are the most memorable ones, cause from these situations you learn the most. This show was so much fun to do. Hard. But rewarding as it looked great. Hard cause both hair and make up was hard to do, so we had to work together. Also cause some of the models was meant to wear contact lenses, and a few of them had never tried it before, but we got there! My favourite show during fashion week was Joshua Kane at the Palloduim. He had made the scene look like a train station and had his collection in four stages beginning with train workers back in the days and then different stages to more privileged people in this era, so we had four different looks to do.The show had a lot of publicity as it was open for the public and you could get tickets for only £10.00. At the beginning and the end of the show there were two ballet dancers on stage dancing to the live music, and it was sooo beautiful, you have to watch the show here. As the show was a bit different, they had to practice the walk for ages, wich meant we only got an hour to do 36 models(!) BUT WE MADE IT! And I don't think I've ever worked so fast. London Fashion Week started on Friday, so I'm insanely busy and don't have any time to do any looks or so for the blog. And on Wednesday me and my boyfreind are going to TOKYO!!!!! So I've scheduled a few posts and when it's all over I will tell you about it. See you later!